I didn’t get to bed until nearly 4 a.m. this morning. That’s because I had to pack up all my gear after last night’s feeding frenzy. I was up at 6 a.m. to shower and find a taxi to the airport. On my way out I woke up my hotel buddy, asleep on a cot by the hotel door. He said a sleepy goodbye and I started my search for a cab. I couldn’t resist and chose a motorcycle taxi over the safety and comfort of a car taxi. It’s my last hours in Vietnam. I wanted my last moments to be uniquely Vietnam. It’s like the last bite of a meal. You want it to be a combination of flavors so that you can savor the experience for as long as possible. You want the right amount of banana to go with your favorite flavor of ice cream covered with just a dollop of fudge so you can taste that banana split for as long as possible. We zipped through the streets, my big bag balanced between the driver’s legs and me on the seat behind. It was 6:30 already, so half the city was up and headed to work. We wove our way through traffic, the driver occasionally honking his horn at merging motos and lane changing cars. The sun was just cresting the horizon so the air was almost cool. I kept having to push my helmet up because it would slip over my eyes. Imitating the Vietnamese, I let my hands sit loosely on my thighs—only foreigners grip the seat handle. We arrived at the airport in plenty of time, at half the price of a conventional taxi. I probably would have paid double for the experience. The early morning bike ride through hordes of early-rising Vietnamese on the way to work and school was just the thing for a good send off. The only thing that could have made it better is if I had been clutching a tall glass of iced-coffee as we bounced through traffic. The flight departed late, but I ended up in Bangkok fine. I was forced to take a taxi to my hotel because the airport train that services downtown wasn’t running. Of course, I only learned this after lugging my bag down three flights of stairs to the closed station. Couldn’t one of the twelve guards I passed have spared me the march? Seems I brought the rain with me. By the time I’d checked into my hotel, the clouds burst. You can tell the wealth of a nation by how it handles heavy rain. In Phnom Penh, the streets flooded and I had to walk barefoot through thigh high water to my hotel. In Saigon, the streets around my hotel flooded during the storm, but drained within 20 minutes of the end of the heaviest rain. 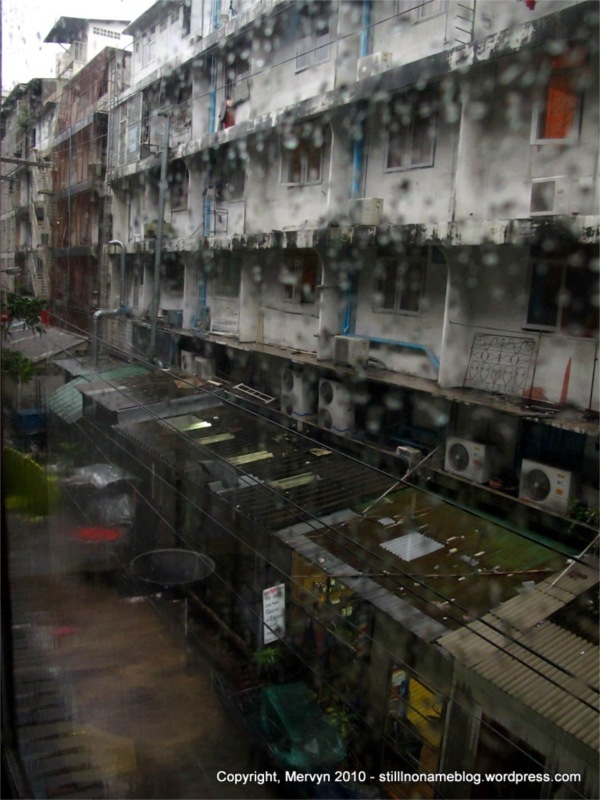 Here in Bangkok, the water in the streets around my hotel never got deeper than a couple inches. Thailand is flood rich. It’s good to be back in Thailand, even if I now can’t read the local language. It does mean though that there’s no denying that I’m winding down my time in Asia. I’m going to try and not think about this. I think I will now go out and stand in some tropical rain. GALLERY: No extra pics today. Cameras don’t deal with water well. ARE YOU STILL GOING TO SOUTH AMERICA? DO YOU NEED A FAKE WHITE TOUR GUIDE? WE CAN PRETEND YOU ARE A PINOY PRINCE AND I AM YOUR CONSIGLIERE! IT WILL MOST AWESOME! I could always use another travel consort. Wouldn’t mind adding a White man to the collection.